It happens to everyone – as we grow older, some tasks that were manageable in our youth become more difficult to complete. But we always remember the sense of independence and accomplishment that completing tasks gave us. Even if they were tasks we didn’t like. That’s not something that’s easy to give up. That’s why many adult children find it difficult to get their parents to accept in-home care – or even consider the possibility. The key is to look at things from our parents’ points of view. In addition to independence, our parents want to maintain their control and dignity; what they don’t want is to suffer the idea that, for the first time in decades, they need a babysitter. Any suggestions of in-home care should be made with this in mind. Instead, be sure to make the point that care providers are assistants; they aren’t there to manage or to take control. Your parents are in charge. They don’t receive tasks or orders; they provide them. That’s an important distinction from the babysitting they outgrew long ago; it’s a difference that should make them more receptive to the idea. As much as adults value their independence, it goes hand-in-hand with the responsibility for handling chores and tasks we dislike. Sometimes that responsibility keeps us all from doing the things we enjoy –like watching a game instead of mowing the lawn or folding laundry instead of enjoying a movie or a book. In-home care provides the freedom to hand-off unpleasant tasks to free up more time to do something more enjoyable. Perhaps your parent doesn’t “need” in-home care, but would rather not do the ironing or shopping or weeding. In-home senior care doesn’t restrict the freedom to do what we want; it provides more time to do what makes life worth living. When readying for a discussion about in-home care, considering your parent’s point to view is a great start. It’s also a great practice to follow when you have the discussion. No matter how much you consider things from your parents’ points of view, there may be reluctance. There may be disagreement, and even arguments and hurt. But every potential negative will be minimized once your parents understand that you’re listening and really hearing. So be sure to really listen, and to address their concerns. If and when your parents understand that they still have a say in their own lives, everything will be much easier. We use our hands for almost everything, so it’s a good idea to know the best ways to prevent hand, wrist, and finger injuries. Unfortunately, these kinds of injuries are extremely common due to the nearly constant use of our hands. Most professions are heavily reliant on the use of our hands whether it’s for typing, writing, organizing, playing an instrument, or performing any sort of skilled labor. There are many ways that you can take precautions against hand injuries. Working some simple changes into your everyday routine can help ensure that your hands remain functional and pain-free. Arthritis of the Hand and Wrist: You’re probably already familiar with Arthritis, as it is a relatively common disorder. Arthritis of the hands and wrists can be extremely painful and even debilitating. Arthritis occurs when the cartilage between your joints wears out and causes the bones to rub against each other making it difficult to move the joint and causing pain. Here are several ways you can stave off arthritis: maintain a healthy weight, don’t smoke or quit smoking, and take precautions at work if your work requires a lot of heavy pushing, pulling, lifting, or typing. Carpal Tunnel Syndrome: This is among the most commonly reported hand injuries or disorders out there. Carpal Tunnel Syndrome develops as a result of regular repetitive activity. Most common symptoms are numbness, weakness, and pain in the hands. While there are no proven methods to prevent Carpal Tunnel, you can reduce stress on your hands by using less force when you grip, type, or write, taking breaks from typing or other activities to stretch your hands and wrists, using good posture, and using an ergonomically designed keyboard or mouse. Smartphone Thumb: This has become an increasingly common disorder as cell phones have become ubiquitous in our society. As phones get larger your thumb’s reach is tested when trying to do one handed tasks on the phone. The repetitive motion of scrolling with your thumb can lead to pain and numbness, and eventually cause larger issues like tendinitis or arthritis. This can be avoided by reducing the amount of time you spend on scrolling on your smartphone and taking breaks to stretch your thumb and hands when you’ve been using your phone a lot. Wrist Tendinitis: Tendinitis occurs when the sheathe that a tendon usually moves through becomes inflamed and causes pain. This can happen to many joints but is particularly common in the wrist and the elbow. Tennis and Golfer’s elbow are forms of tendinitis. Here are some ways you can prevent tendinitis: avoid activities that put excessive stress on your joints, mix up your exercise routine by rotating out activities to give joints a rest, stretch before physical activity, use good posture in the workplace, and improve your technique when it comes to repetitive activities. If exercise or work that involves repetitive movements are causing you pain, figure out a way to do that activity differently in a way that is not painful. Hand and wrist injuries are extremely common, and often debilitating. Keep your hands, wrists, and elbows functioning properly by taking care when doing repetitive activities or any kind of activity that causes strain on your hands wrists, and arms. It can be tough to remember to take breaks to stretch your hands, especially if your work requires constant activity of your hands. It can be a good idea to set a reminder on your computer or phone to take a short stretching break every half hour or hour. Once a good habit is established it’ll be much easier to remember to take a break to stretch. Hopefully these tips will help you prevent painful hand and wrist injuries. 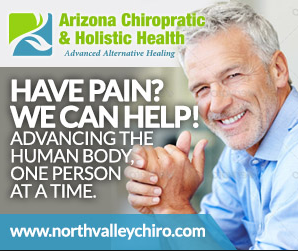 If you are experiencing joint pain in your hands and wrists currently, make an appointment with your local orthopedic hand specialist to get the treatment you need today. Catching these disorders quickly can save lots of pain and hassle further down the road. But you can’t just call the boys up and have them over for game day without getting ready for them. No one likes going over to a house to spend their day if the right preparations haven’t been made. 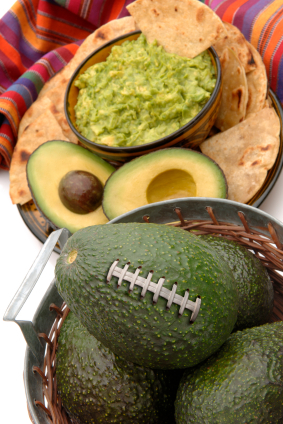 Be a great host for any game day experience, whether that’s college football on Saturday or the NFL on Sunday. Here are 4 tips that will improve your game day experience and impress any and all of the guests you have over, whether it’s the boys or your neighbors. Whether cooking is in your wheelhouse or not, you need to plan accordingly to have enough snacks to last your guest all day. You should consider both the number of guests and their appetites but also make considerations for any food allergies. There are of course the game day staples like chicken wings, nachos, pizza, chips & salsa, potato chips, and, the tried and true, buffalo chicken dip. You can also get more adventurous with your food selection with items such as hot crab dip, cauliflower hummus, Tex-Mex shrimp cocktails, Korean BBQ sliders, or even mini veggie pockets. No matter what, cater to your audience and make sure you have enough. Whether it’s cracking open a cold one or making the perfect cocktails, no gameday is complete without a drink in your hand. Again, it’s important to keep your audience in mind when preparing the beverages. Do you need to stock up on rum and bourbon or will you need to get a couple cases of beer. Even further, what kind of quality are you going for? Coor’s Light is great, but may not be for the craft beer crowd. Maker’s Mark is a great option, but you don’t want to break the bank on a crowd trying to do bourbon and cokes. Choose your drink options wisely knowing who might be coming over and what is within the budget. And of course, you can always make gameday a BYOB occasion. No one will second guess you if you do ultimately ask everyone to bring their own beverages. Before the crowd comes over, make sure that you can show the games as promised. Check to make sure that you get all the channels necessary to show the games that your friends or neighbors want to see. This is especially important if you do not have a cable package; you’ll need to identify your streaming options for the games you want to show. Also, you’ll want to double check your audio to make sure that it is set up properly. Now, most of you will be using the audio from the TV; however, if you plan on setting up the surround sound system, be sure that everything is working before the group comes over. 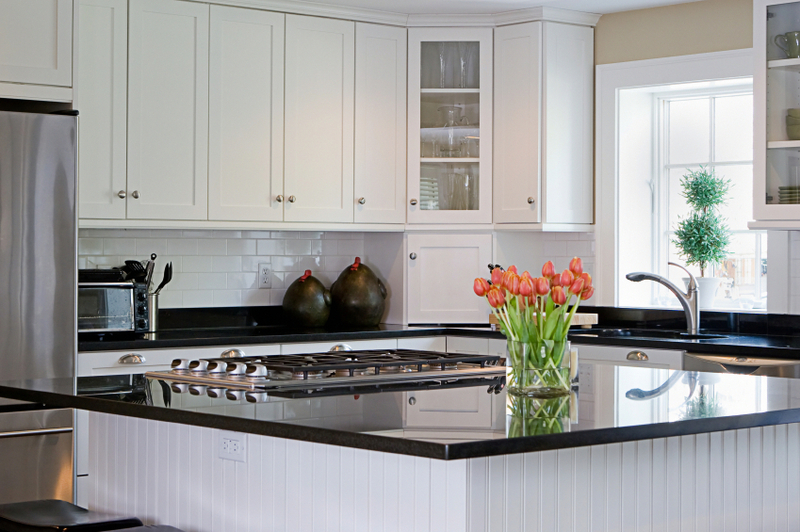 Last but certainly not least, be sure to clean up your home before the crew comes over. I know this seems unnecessary or the last thing you want to do in preparation, but you’ll be glad when you do, especially when you wake up the next day. You’ll want to clean the bathrooms, cleans your carpets and upholstery, clean and prep the bar area, and clean any areas where you’ll be serving food. If you haven’t cleaned your carpets or upholstery in a while, you may want to check out a company like this one to do it for you. Hard surfaces like those in a kitchen or bathroom are a lot easier to clean yourself, but carpets and upholstery can be very tricky to clean. If you follow these 4 tips, I can guarantee that you’ll have a great game day experience in your home, and your friends will certainly want to come back. Be careful though or your home might become the new go to spot each and every week this football season. One of the most over-looked aspects of taking care of your body is often your dental hygiene needs. As you age, different medical conditions can also begin complicating your hygiene routines and how your body reacts to various dental practices, such as flossing and brushing your teeth. It’s absolutely vital that you take care of your mouth properly, and practice great dental hygiene routines that are easy to get in to, to ensure that your mouth is in its best possible shape. A great tip for any dental hygiene-related issues is to find a general family dentist that you really enjoy and trust. 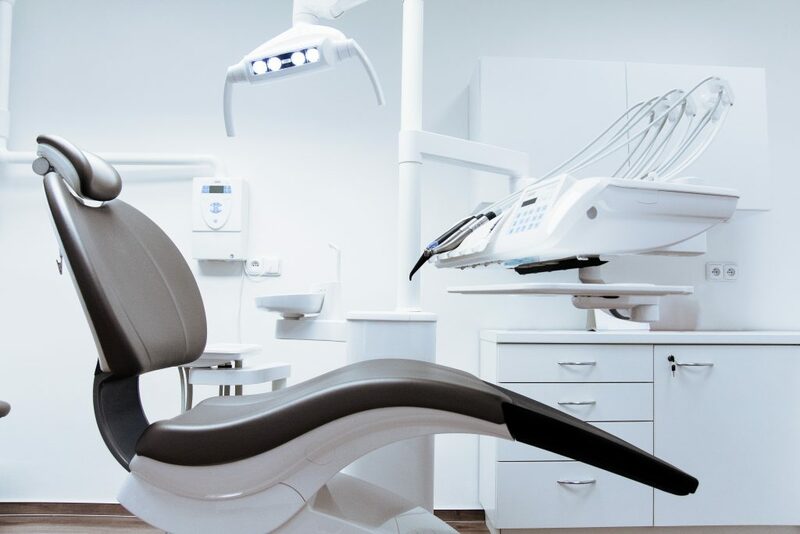 Finding a professional dental care company that not only accommodates your needs, but doesn’t frighten or hurt you accidentally is a wonderful find. It’s extremely simple to develop good dental hygiene routines, but it’s just that: a routine. It takes time, and consistency, to truly develop and implement a dental care routine that works for you. Some people may prefer brushing their teeth while showering, others may prefer brushing their teeth after their morning cup of coffee, but what matters is that they are doing it! It’s so easy to forget to brush your teeth, or floss at night, that many people just don’t! There are other important factors that all play into your dental hygiene as well, such as your diet, your genetics, and sometimes physical conditions can factor in as well, such as constant dry mouth. One of the absolute best tips for taking care of your mouth is to avoid anything sugary, acidic, or purely harmful for your mouth. This includes processed sugars in sodas, heavy amounts of coffee, smoking, or using dipping tobacco. Heavy soda consumption combined with smoking and drinking often can be the number one cause for gum disease, cavities, and potential mouth cancers. The money you end up spending in the end on expensive, pricey surgeries and procedures can be avoided entirely by taking care of your mouth and dental needs throughout your life. If all else fails, brushing your teeth at least once a day should be the bare minimum you strive for. If you’re striving for an excellent, all-encompassing dental hygiene routine, you should look to brush your teeth twice a day, floss at least once a day, and incorporate rinsing into your routine as well. In some recent studies, dentists have stated that they believe flossing is just as, if not more, important than brushing! It contributes to a decrease in overall plaque in your body as well, which can help with blood pressure and cholesterol problems over time. One of the first steps you’d want to take to improve your overall dental health is to ensure that you are sticking to a great diet and a good dental routine in the morning and evenings. 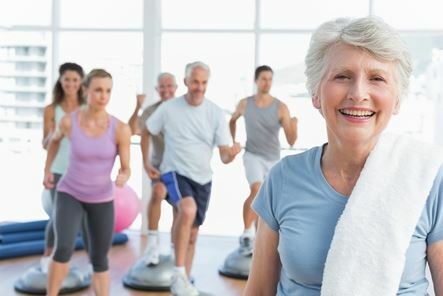 As we get older our bodies require more and more upkeep to stay healthy and active. Anyone over the age of 50 can tell you that it becomes more difficult to keep flabby arms and belly at bay the older you get. Exercising certainly doesn’t get any easier with age either. Endurance – Also known as aerobic exercise, endurance exercises increase your breathing and heart rate. Some examples are running or walking, dancing, swimming, and biking. Strength – Strength exercises are focused on building muscle. Lifting weights or using resistance bands are a good way to improve your muscle tone and retain strength. Balance – Balance exercises help to prevent falls. Yoga is a common balance exercise that can also help with strength and flexibility training. Flexibility – Flexibility exercises involve stretching your muscles to keep them limber and prevent sprains and muscle tears. Regular stretching and yoga are a good way to practice flexibility. 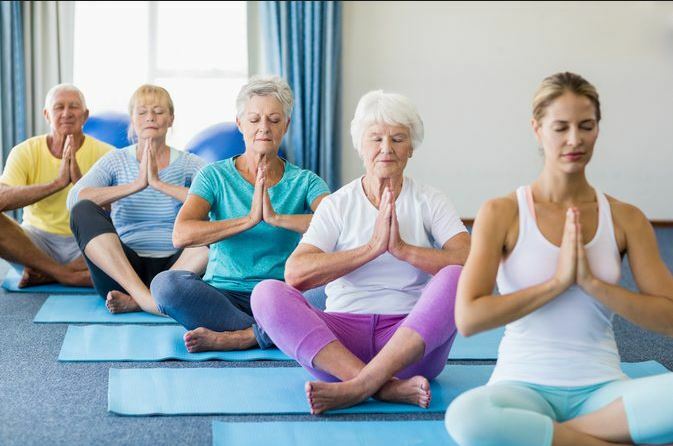 Aerobics Training – Aerobics training is great for seniors because it’s low impact, and can be tailored to your level of strength and ability. There are a wealth of online Aerobics exercises, as well as routines you can purchase on DVD. These can be done with very little space and equipment in the comfort of your own home, or if you prefer more social exercise, there are generally several aerobics classes a week at most gyms. 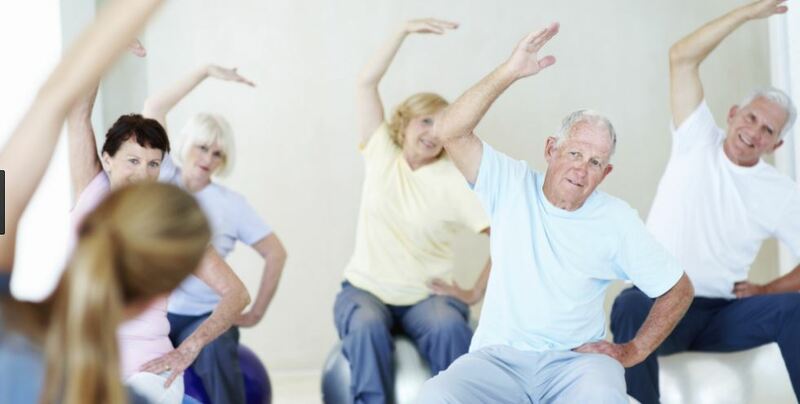 There may even be a specific aerobics class for seniors. Water aerobics is particularly popular for seniors because exercising in the water reduces impact even further. Lifting Weights – I’m not talking about doing any intense deadlifting or anything, just some simple exercises with 3-5 lb weights or resistance bands can work wonders for your upper body strength. Hold your weights or bands, and raise your arms to the sides, pause, then overhead, pause, back to sides, pause, and back down. Shoot for about 10 reps each day, and you’ll be amazed at the results over the course of a few weeks. When it starts to get too easy, add extra weight. Toe and Chair Stands – Toe and Chair stands are a great balance exercise that can help to reduce your risk of falling. Start by sitting in an armless chair, and raise your arms out in front of you. Stand up out of the chair without using your arms. Slowly lower yourself back into the chair. Repeat this 10 to 15 times. For toe stands, stand behind the chair and use the back for support, push up on your toes to stand on tiptoe for about 30 seconds, then slowly come back down. Repeat 10-15 times. This will help strengthen both your calf muscles and your thigh muscles to improve your overall balance. Low Impact Stretching – There are many different kinds of low impact, flexibility based exercises, such as yoga, tai chi, and pilates. Often a full routine in any of these disciplines will help with strength, flexibility, balance, and aerobics. These are all exercises that are easily completed in the comfort of your own living room through online videos or DVDs, but again if you prefer more social exercise, your local gym probably has regular sessions for each of these types of exercise. For many people it can be difficult to motivate yourself to exercise, but the benefits will definitely be worth it. If you’re a senior who is still able to drive yourself around, it might be easier to motivate yourself by going to the local gym. Exercising in a group is a great way to push yourself to exercise harder because you’ll be watching other people who are also working hard to get in shape. If you aren’t able to drive yourself to the gym, you could ask your in-home caregiver, or a friend or relative if they can take you to the gym for regular classes. If you prefer to exercise in the comfort of your own home, it’s recommended to make it a part of your daily routine. Set up a time of day that you like for exercising, it could be in the morning after you make breakfast, or maybe in the afternoon before dinnertime. Making exercise a part of your routine will make you less likely to forget to do it, and more likely to look forward to it and enjoy what you’re doing. Take the time out of your day to start doing some basic exercise routines. It will increase your overall health, make you more active in general, and might even help you get some extra rest at bedtime. If you have an in-home senior care service, you could even ask your caregiver to get involved with you. A little healthy competition goes a long way when it comes to regular exercise. With regular exercise, you’ll find that your quality of life will increase dramatically in a very short amount of time. Paired with a healthy diet and a good sleep schedule, you’ll feel 10 years younger in just a few weeks! When it comes to your teeth and dental routines, there are pretty stark differences between men and women. Although the basics of both are the same, men are more likely to ignore their dental care, which can drastically increase their risks for tooth loss, disease, mouth cancers, and cavities. Some of the most basic dental practices include brushing your teeth twice a day, flossing once a day, and actually visiting the dentist – preferably twice a year! It’s easy to overlook the foundation of good dental hygiene, and once you start prolonging your trips to the dentist, it’s easier and easier to keep putting them off, but in the long run, this is the wrong decision, that could lead to intense dental pain or require serious dental work to take care of. Taking the 5-10 minutes daily to maintain your teeth will save you thousands of dollars, and plenty of time, in the end. It’s important that you find a good dentist who can take care of your family dental needs, emergency dental care, and handle any general dentistry complaints you may have. In my case, I go to a local dentist, who specializes in family dentistry, Shoreview Dental. There are a few ways to develop a great dental hygiene routine, and it starts with knowing what neglecting your mouth can lead to. If you happen to eat sugary foods, drink acidic beverages, and don’t take care of your teeth, gum disease, dry mouth, and cavities will begin to take over, leading to pain, irritation, and potentially serious illnesses such as mouth cancer or an infection. One of the biggest consequences of not taking proper care of your teeth is gum disease. According to the American Academy of Periodontology, nearly 60% of all men have some form of gum infection, compared to a significantly lower 38% of women. 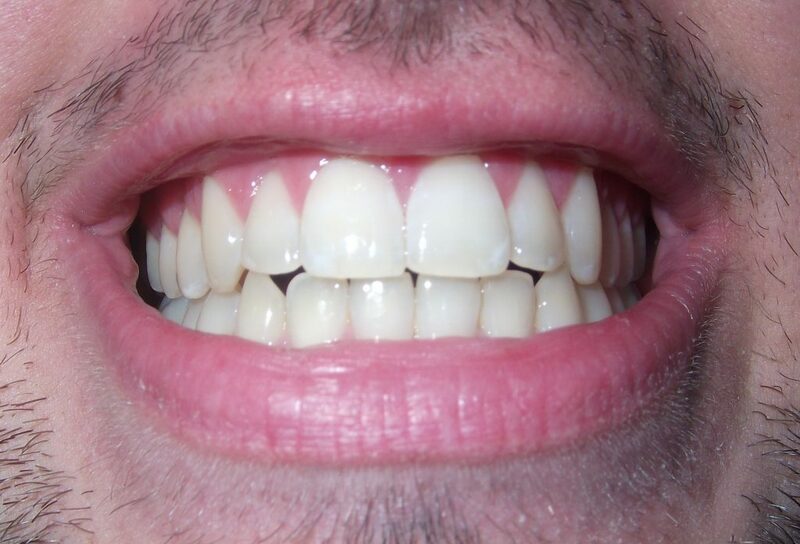 Unfortunately, neglecting your teeth can have negative consequences on the rest of your body as well. Because gum disease and mouth problems lead to inflammation, it can eventually begin damaging your blood vessels if the infectious bacteria makes it into your bloodstream. This could potentially lead to various inflammation-based issues such as heart disease, prostate issues, or even erectile dysfunction. Like everyone else, the health and well-being of anyone’s mouth can affect your body in other ways as well. In order to maintain and stay in the best shape possible, it’s vital that you don’t skip over your teeth! Your knees are one of your body’s most important joints. Without a properly functioning knee it would be impossible, or at least very difficult, to stand, walk, run, or even sit down. 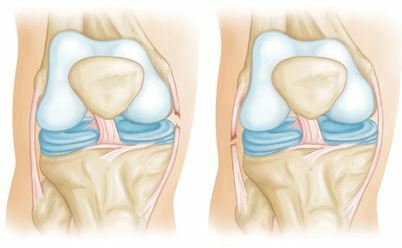 Unfortunately, knees are often the first joint to be injured from sports or common wear and tear as a result of age. The human knee is a fairly complex system of ligaments, tendons, bones, and cartilage, meaning there are many ways that it can be injured. The majority of knee injuries are a result of contact or impact heavy sports, and can require treatments ranging from rest and ice at home to full blown orthopedic surgery. In very serious cases a knee injury may require a total knee replacement surgery. Fractures – Bone fractures in the knee are extremely common. 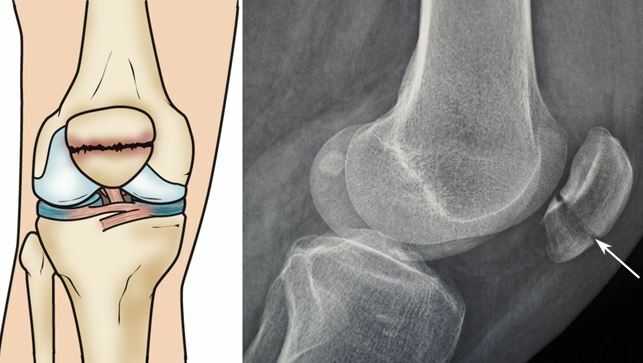 The most commonly fractured or broken bone in the knee is the patella or kneecap, though the ends of the femur and tibia can also fracture as a result of knee trauma. Knee fractures can cause extreme pain and make it difficult or impossible to walk or stand. Generally knee fractures are caused as a result of high energy trauma like car accidents or a fall from a significant height. 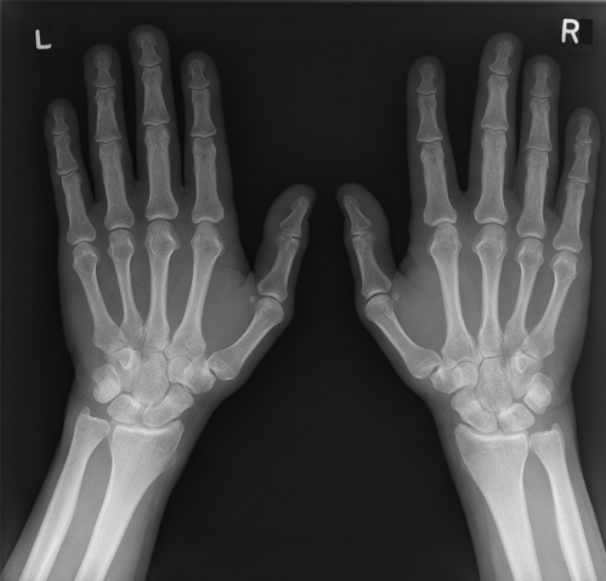 Dislocation – Dislocations are similar to fractures, but instead of the bone breaking or cracking, it is dislodged or misaligned from its normal placement. Dislocation can affect any of the bones in the knee with the most common cases involving the tibia and femur being forced out of alignment, or the patella being knocked out of place. While some dislocations are caused by abnormalities in a person’s knee structure, the majority of dislocations are related to high energy trauma, such as sports related contact or a car accident. Anterior Cruciate Ligament (ACL) Injuries – Tearing your ACL is a very common sports-related knee injury. You may have heard about famous NFL or NBA players tearing their ACL and being out for a season. 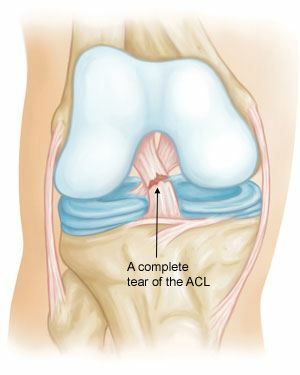 Generally an ACL tear is caused by rapidly changing direction, or landing incorrectly after a jump, making it a common injury for soccer, basketball, and football players. Often, ACL injuries occur alongside other knee injuries like twists and sprains. In serious cases ACL injury requires surgery to regain proper function. 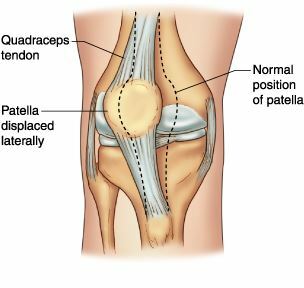 Posterior Cruciate Ligament (PCL) Injuries – PCL tears are not as common as an ACL tear, but they do happen. Usually these injuries are only partial tears and have the potential to heal on their own with proper care. PCL injuries are usually a result of a blow to the front of the knee while it’s bent. They commonly occur as a result of sports-related contact or car accidents. 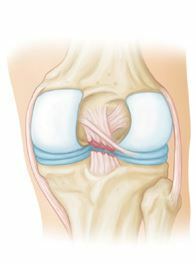 In serious cases, a PCL tear may require knee arthroscopy surgery to correct. Collateral Ligament Injuries – The collateral ligaments run along either side of the knee joint holding the femur to the tibia and fibula. Tearing these ligaments is far less common than tearing an ACL or PCL, but in cases where the knee is pushed or bent sideways these ligaments are the first to be injured. These ligaments are usually torn when the knee experiences a direct blow to the outside of the knee, and are most often sports related. Meniscal Tears – There are two chunks of cartilage that sit between the points where the femur meets the tibia, this cartilage is referred to as the meniscus, or menisci (plural). 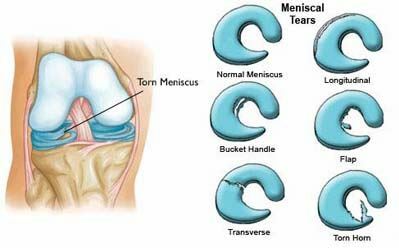 Meniscal tears are common in sports, but can also result from old age as your menisci get weaker with age. Meniscal tears are generally sudden and result from twisting, pivoting, quick direction change, or being tackled. Sometimes in the elderly, all it takes is an awkward twist when standing up to cause a meniscal tear. Usually a torn meniscus can be treated non-surgically, but in cases where that doesn’t work, knee arthroscopy is a popular option for treatment. 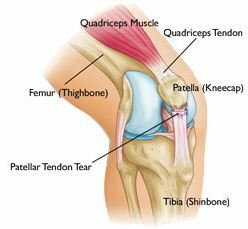 Tendon Tears – The two major tendons in the knee are the quadriceps and the patellar tendon. Normally these tendons are overstretched or torn by middle-aged people who play running or jumping sports. Generally these tendons are injured from falls, a direct blow to the knee, or landing awkwardly from a jump. Many times, small partial tears are treatable with non-surgical methods, but when there is a complete tear, surgical procedures are often required. While this list doesn’t cover every knee injury, these are the most common injuries people experience. Sports-related knee injuries are incredibly common, and should be treated by an orthopedic professional like Dr. Bill Nordt in Richmond, VA.
Knee injuries can be very serious and if not treated properly can cause a lifetime of pain and difficulty walking. If you are suffering from a knee injury, make sure to contact your local orthopedic specialist today and get the treatment you need to get back on your feet. If you’re like me, you have a rough time with seasonal allergies during the spring and summer. This year started out particularly bad for me, and try as I might I wasn’t able to get away from my allergies even when I would try to stay inside all day. For a while I was trying everything I could to keep my runny nose and itchy eyes at bay: doubling up different kinds of allergy medications, keeping all the doors and windows shut, and even wearing a mask and goggles to mow the lawn. While these all had varying effects, I was still having far more trouble than usual with my allergies indoors. One article I came across mentioned the fact that leaky ductwork can be a major source of pollen and allergens getting into the home. I realized that I hadn’t had the ventilation system in my home checked since we bought the place 10 years ago, so I decided to call some local experts to come take a look at my system. I called the technicians at Bradley Mechanical, one of the local HVAC companies here in Richmond that specializes in custom ductwork, and they came to check out my home’s ventilation. As it turns out, there was a gash in my duct near the edge of my attic that was pulling dust from the attic as well as pollen from outside into my ventilation system. That meant that pollen from outside was getting pulled into my ductwork, along with other indoor allergens, and then being actively pumped into my home. No wonder my allergies were so out of control! Luckily for me, the technicians see this kind of thing all the time, and it was a quick fix on their part. 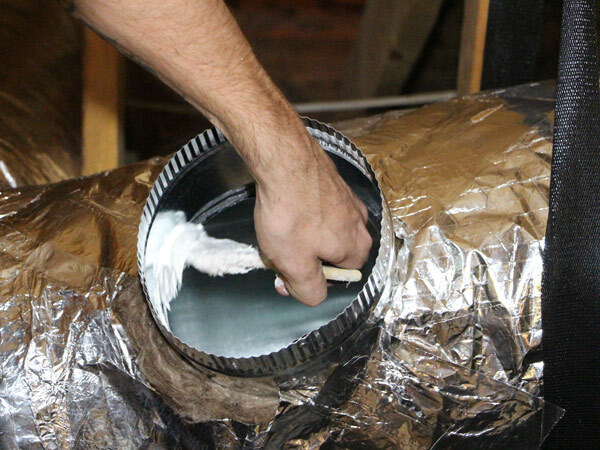 Since they make custom ventilation systems and ductwork on a regular basis, they were able to change out the torn piece of ductwork and replace it pretty quickly. Once the new piece was in place, they performed an air quality check to make sure there weren’t any other issues with my ventilation. They were very thorough with their work, and after a week and a half I’ve been able to breathe again in my own home. So, if you feel that you’ve been suffering from seasonal allergies more than usual this year, it might be time to have your ductwork and ventilation looked at by a local professional. 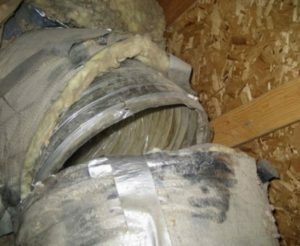 In many cases a torn duct can cause other respiratory issues, like asthma, in addition to seasonal allergies. It’s the kind of thing that has a constant impact on your life, but might never cross your mind. Even if you don’t have particularly bad allergies, it’s a good idea to get your home’s ventilation system checked for any rips, tears, or bad connections. Over time, ductwork tends to wiggle out of its couplings and lose efficiency in addition to pulling unwanted particles into the system. Most places will run a test on your ventilation for pretty cheap, and if there are problems, getting them fixed promptly will save you money throughout the year by making your system more efficient. It’s an easy thing to forget about when you look at the long list of maintenance tasks that come with owning a home, but it’s worth it to make sure your home is circulating clean air and maintaining a high indoor air quality.